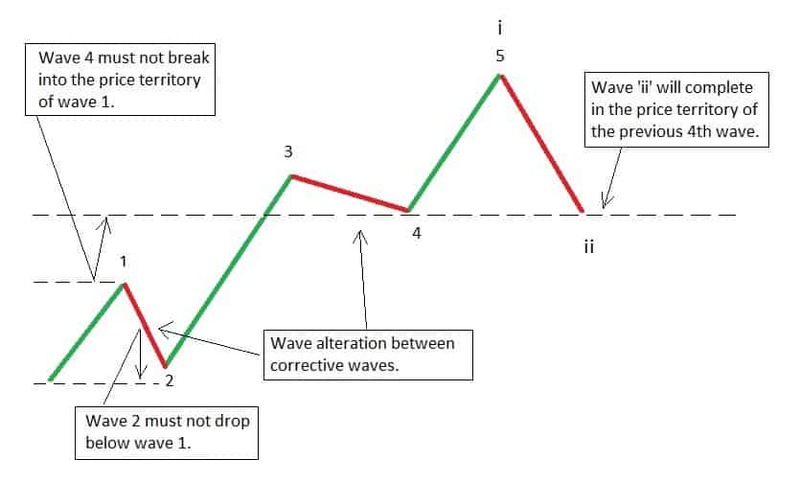 AWESOME GUIDE to Elliott Wave Correction Patterns and Rules!! Elliott Wave Corrections are a hell of a thing - do you agree? During an Elliott Wave correction pattern the price takes a hell of a long time to do absolutely nothing! Correction patterns are hard to track, but these patterns do follow rules. And if you follow the rules and guidelines of Elliott wave patterns. You will be able to forecast the timing and possible price targets, for where the market could turn back into trend again. In total there are 13 major Elliott wave patterns, and I'm going to show you how to identify, and navigate them using the Elliott wave rules, in this guide. Elliott Wave Correction Rules and Characteristics. Rule 1: Wave 2 correction must not retrace more than 100% of wave 1. Rule 2: Wave 4 must not cross into the price territory of wave 1 in an impulse wave, but Wave 4 can overlap wave 1 in a leading or ending diagonal wave. Rule 3: Wave alteration - If wave 2 is a deep correction - then wave 4 will be shallow. Rule 4: Wave 2 will bottom in the price territory of the previous 4th wave of one lower degree. Rule 5: Corrections are always fully retraced by the resuming impulsive trend. Here's a short video on Elliott Wave correction patterns. 1: ABC ZIGZAG correction wave - 5,3,5 internal wave form. 2: ABC FLAT corrections - 3,3,5 internal wave form, regular and irregular types. 3: TRIANGLE ABCDE corrections - 3,3,3,3,3 internal wave form. 4: COMBINATION corrections - additive structure made from multiple simple corrections. 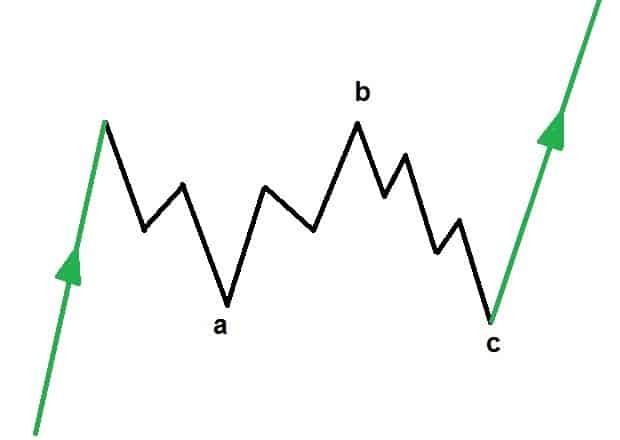 A simple three-wave correction pattern labeled A-B-C, also called a ZIGZAG correction. The ABC correction wave is the simplest of all Elliott wave correction patterns. The ABC correction pattern subdivides into 5-3-5 internal wave pattern. Waves A and C tend towards equality in length. The ABC correction wave usually appears in the position of wave '2'. An ABC correction wave will usually target the 61.8% retracement of the trend move. Using these guidelines, you can estimate a possible ending point to wave C using the length of wave A. 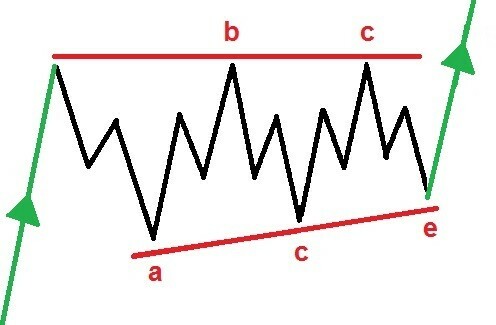 When the structure is complete and wave C has come to an end, A trader can place an order at the end of wave B, expecting the price to turn back into trend again. This is a more complex version of the simple zigzag, the double zigzag forms when two separate simple zigzags come together to form the larger structure. The WXY correction pattern subdivides into 3-3-3 internal wave pattern. Waves W and Y tend towards equality in length. The WXY correction wave usually appears in the position of wave '4' or wave 'B'. Using these guidelines, you can estimate a possible ending point to wave Y using the length of wave W.
The notation is changed to differentiate the complex version from the simple form. 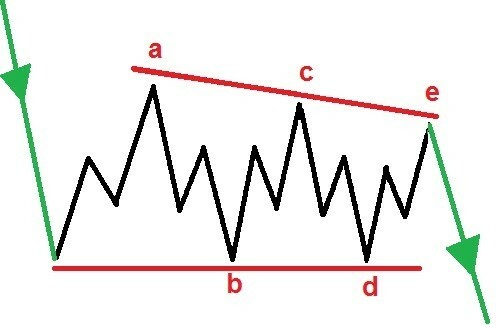 To take advantage of this Elliott wave pattern a trader will use the same approach as the simple zigzag, by placing an order at the end of wave (x), and when the price turns back into the trend again you will catch the resuming trend. 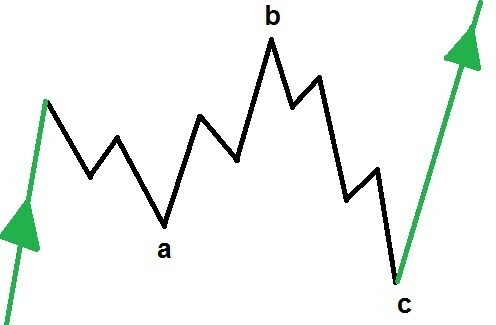 An ABC flat correction differs from a zigzag in that the wave form traces out a 3-3-5 wave form, in general ABC flat corrections retrace less than zigzags. The more powerful the underlying trend, the shorter the flat correction tends to be. The flat correction pattern subdivides into 3-3-5 internal wave pattern. Waves C tends towards 100% the length of wave A. The flat correction wave can appear in any corrective position. An flat correction wave will usually target the 50%% retracement level of the previous move. 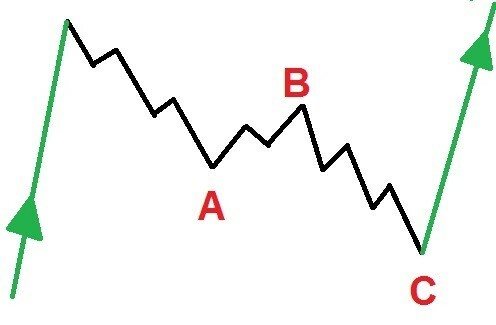 Again, the trader can use the end of wave 'b' to enter the market and catch the resumption of the trend move. Expanded flat Elliott wave correction. The expanding flat Elliott wave pattern takes the same internal form as the normal flat correction pattern. and the end of wave 'c', will travel past the end of wave 'a'. This causes an expanding range in the flat pattern, which increases the overall distance traveled by the structure. This pattern is also called an irregular flat correction. The expanded flat correction pattern subdivides into 3-3-5 internal wave pattern. Waves C tends towards 162% the length of wave A.
with the aim of catching the market as it re-enters the trend move again. Running flat Elliott wave correction. The running flat Elliott wave pattern also has an internal 3,3,5 wave form similar to the normal flat correction pattern. This classifies the pattern as a flat correction. is that wave 'b' will retrace more than 100% of wave 'a'. And then, wave 'c' will fail to retrace 100% of wave 'a'. So, a running flat will complete in the direction of the larger trend. In an uptrend wave 'c' will create a higher low. And in a down trend, wave 'c' will create a lower high. A running flat correction subdivides into 3-3-5 internal wave pattern. Wave 'B' breaks the beginning of wave 'A'. Waves C tends towards 100% the length of wave A and will not break the low of wave 'A'. The running flat correction wave can appear in any corrective position. 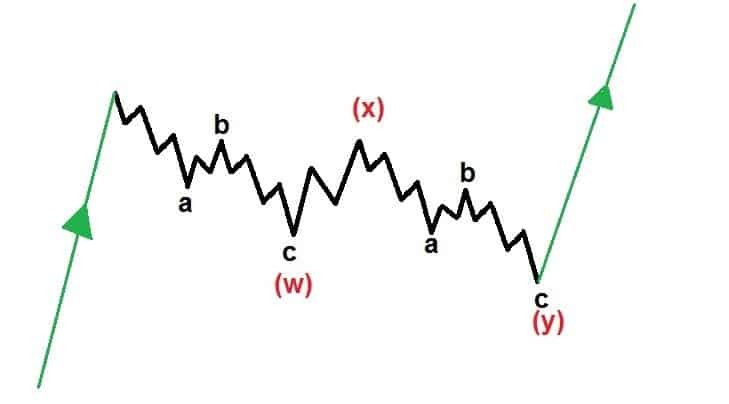 Again, a trader can use the starting point of wave 'a' to enter a trade, with the aim of catching the market as it re-enters the trend move again. Although a running flat is one of the trickiest patterns to call as it develops. Elliott wave triangles are overlapping five wave corrections labeled ABCDE. 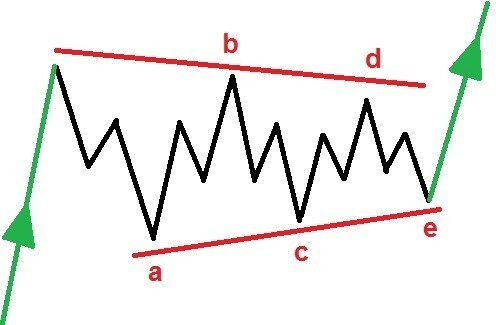 Triangle waves usually contract the range of price action from beginning to end. Each internal wave takes a three wave form, and the triangle subdivides into a 3-3-3-3-3 pattern. 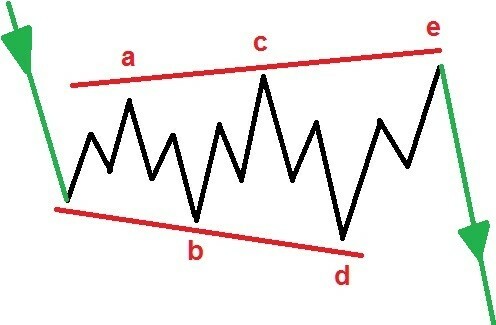 An ABCDE pattern causes a sideways movement that is usually associated with decreasing volume and volatility. Elliott wave triangle waves usually occur in the position of wave B or wave 4 of the larger pattern. A triangle wave is usually the penultimate move in the larger Elliott wave pattern and leads to an explosive move back into the larger trend. The contracting triangle is a horizontal contraction in range of the price. An Elliott wave triangle traces out five internal moves each of three waves. The distance traveled by each subsequent wave reduces in length. This has the effect of contracting the range of the wave, hence the name! A low risk trade can be placed at the end of wave 'e' with the idea of catching the market as it turns back into the trend. A descending triangle usually appears in a downtrend. The lower bound of this Elliott wave triangle pattern holds in a flat line while the top trend line drops as usual, and the overall range of prices contracts. The ascending triangle usually appears in an uptrend. The upper bounding trend line of this Elliott wave triangle pattern holds in a flat line and the lower trend line rises, and the overall range of prices contracts into wave 'e'. Again, the same strategy applies, a low risk trade can be placed at the end of wave 'e' with the idea of catching the market as it turns back into the trend. An elliott wave expanding triangle appears in both downtrends and up-trends. The top trend line rises and the bottom trend line falls, and the overall range of prices expands into wave 'e'. This time the end of wave 'b' of the elliott wave triangle is used to place a trend trade. COMBINATION CORRECTIONS - double and triple 3. A Elliott wave double or triple three combination, is a corrective Elliott wave pattern. It happens when simpler wave forms stick together to form a larger structure. For the most part, double threes and triple threes are horizontal in character. 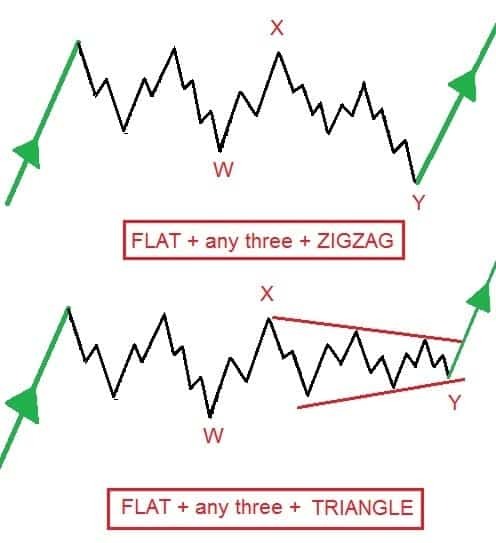 There is never more than one zigzag in a combination wave, also there is never more than one Elliott wave triangle. All of the Elliott wave patterns shown above take the same form whether the trend is rising or falling, in a falling trend, the image is simply inverted. The best way to enter a trade off a combination structure is to place an order at the end of wave 'x' and if the market crosses this point, it is likely that the trend has resumed and you can ride that trend until its completion. Correction patterns are simply a pause within the larger operating trend. When corrections come to an end, prices usually explode back in the direct of the larger trend. And it will help you enter the market at the correct time with low, and defined risk levels. If you master Elliott wave correction patterns, you will be able to get in at the ground floor and ride the trend until the end! In the following video I go through how to identify if a trend or correction is 'mature' or not. When a trend is mature, it is time to look for a signal that the market is going to move back in the direction of the larger trend. This can be done using timing analysis along with elliott wave pattern analysis to figure out the most likely area for a reversal to occur. I know what your thinking!
" How do the Elliott wave rules of corrections help my trading? " Here's one recent example, of how a completed correction led to a MASSIVE price move. And how a good knowledge of Elliott wave correction rules and market timing helped us catch a 1200 point move! A completed correction suggested a larger rally dead ahead in CRUDE! HERE IS the analysis, BLOW BY BLOW! The wave count was clear, and the potential for a huge rally was large. "The current wave count sits at a very pivotal point 'in the price structure. With a possible third of a third wave up, on the cards over the next few weeks." The wave count was calling for wave (C) to rally higher, out of a completed Elliott wave triangle (B) wave pattern. and the Elliott wave pattern was clear! "Watch for a short decline to complete wave (ii) grey. At that point look for a bullish break of the wave (i) high to confirm wave (iii)." can increase your chances of catching the next trend move by a huge margin. If you understand the Elliott wave rules and guidelines for corrective patterns, you can use that knowledge to increase your chances of a successful trade when the correction ends. And that is why Elliott wave patterns are so important to understand.